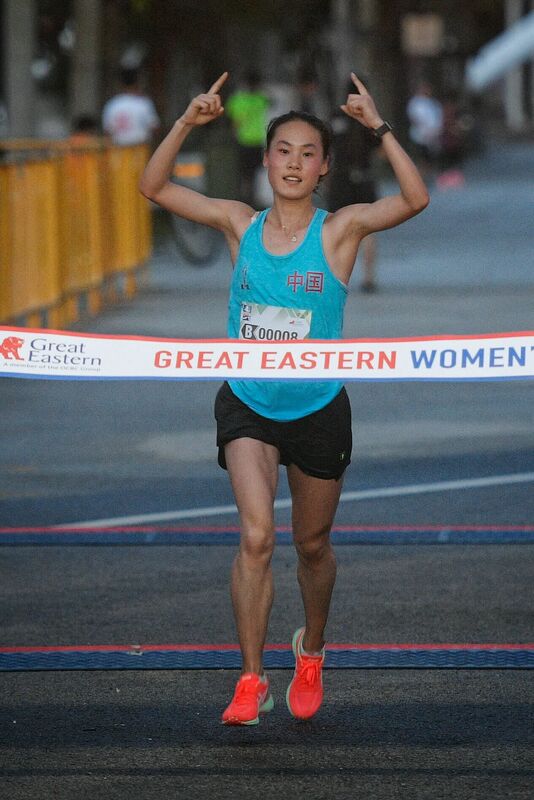 SINGAPORE - About 13,000 runners took part in the 12th edition of the Great Eastern Women's Run (GEWR), which flagged off at the Singapore Flyer and ended at the Marina Bay Floating Platform on Sunday (Nov 12). In addition to the 5km, 10km and 21.1km races, this year's event featured a 2km race for mothers and their children. China's Jin Mingming won the elite category of the half-marathon, while Mok Ying Rong was the top local finisher. Professional runner Jin was competing in her first overseas race here, and was pleased to achieve her goal of winning the race. "It's a little humid in Singapore and as it's already winter in China, I'm not used to the weather," said the 21-year-old, adding that she kept herself hydrated to replenish the fluids lost. "I feel pretty good and this is a very well-organised race. There are a few sharp turns on the race route so I had to decrease my speed as I approached my turns, and that took up a fair bit of my energy." Jin was not the only first-time GEWR participant who enjoyed her experience. Housewife Sharifah Jasani signed up for this year's event because she was inspired by her 40-year-old friend who runs regularly and competes in half-marathons. Describing her experience as "stressful but fun", the 30-year-old Sharifah said she felt encouraged to see other women of different ages taking part in exercise. She added: "Running together with the rest of the runners motivates me, and I'll consider training for the 10km category next year."